Are you looking to give your IKEA Billy bookcase a new look? Maybe you got one while you were in college, or maybe for your first apartment. Well, don’t donate that IKEA Billy bookcase, give it a makeover! Y’all know I’m a Homeright Ambassador, and you may remember when I participated in an IKEA Tarva hack challenge last fall. In fact, I actually won that challenge. Well, Homeright has issued another challenge for us! Homeright sent us a small IKEA Billy book case and asked us to do “our thing” to it. I’ve never had an IKEA Billy before, so I really didn’t know what to expect! These are the pieces of the small IKEA Billy bookcase. Since I wasn’t totally sure what I was going to do with it, I just started putting it together following the directions. I did know that I wanted to use rustic fence boards for the back instead of the handy board that was included with the bookcase. I already did that once with this little window cabinet. To make the Billy bookcase stronger, I used Gorilla wood glue for all of the dowels. Aren’t you so envious of my snazzy manicure? The Billy bookcase went together pretty smoothly. In order to have something substantial to secure the fence boards, I added some scrap plywood to the bottom (rear) of the bookcase. While doing a dry fit of the fence board, I noticed that there was a gap between each shelf and the fence board as well. I used more scrap pieces to fill in those gaps. NOTE: see the peg holes and the routed area for the handy board back? You’ll see later that I fill those in with wood filler. How do you paint over a laminate IKEA Billy bookcase? This is how I did it. I roughed up the entire surface by lightly sanding everything, then used my HomeRight Finish Max and some French Vanilla Chalk Type paint from Heirloom Traditions. I painted it on a drop cloth inside my new spray shelter. Since I used the spray shelter on the driveway, I put down a drop cloth and held the back of the spray shelter out of the way by weighting it down with a paint can. I also took this opportunity to put a second coat on my wine bottles for my wine bottles and more. oops! While I was waiting for the paint to dry, apparently there was a small gust of wind. Note to self, secure the spray shelter while using it on a hard surface. Now, this is where I disguise the fact that this is an IKEA Billy bookcase. I patched all the peg holes and that groove in the back. After a coat of paint, I noticed that I needed to do some additional patching before the second coat of paint. When I attach the fence boards, the 2 shelves will become permanent instead of adjustable shelving. If you take a closer look you can see the extra little piece I added to the back of the shelf to enable the fence board to sit flush against the shelf. A view from the back after I have sanded the patching. See the small piece of wood I added to the shelf? I hurriedly picked up the first poly I saw on the shelf to give a protective coat. oops! It worked great in the Finish Max, it was quick and easy. BUT, it sort of yellowed the paint. I really should have used the topcoat from Heirloom Traditions. Why was I in a hurry? It was H.O.T. and I wanted to do a quick coat and get back inside the house. Fast forward a week or so, and I was running out of time to get this project finished. I worked very early in the morning before the heat set in. I had already cut my fence boards to size, so this was going to be a piece of cake! I would be in the house before the sun finished rising. I used my Ryobi staple gun to secure the fence boards to the back of the bookcase—top, bottom, and both shelves. I had to rip one fence board to get the right width. I really should have ripped a little off of each board to make the uniform. It’s looking less and less like an IKEA Billy bookcase, don’t you think? I wasn’t really happy with how the bottom looked, so I ripped another fence board and attached it to cover up the original Billy bookcase trim. I really wasn’t pleased with how it looked. I felt like it didn’t have enough “repurpose” to it to suit me. I contemplated adding a window/door to the lower portion of the bookcase. The sun was getting higher in the sky, I needed to move to a more shady spot to think about this. Uh oh! As I was moving the bookcase on two small dollies, the bookcase shifted, slipped off the dolly and busted the bottom. ugh! now what? Forget the window, let’s move on to Plan B. It was hot and apparently I forgot to take any pictures. Basically I cut 2 fence boards for each side of the IKEA Billy bookcase and 2+ some for the top. I also ripped some boards for a front facing, mitering the top corners. It’s D.O.N.E. !!! I love how it turned out! My goal was to disguise the fact that it is a Billy bookcase, and I think I pulled that off, don’t you? So, there you have it, how to give your old IKEA Billy bookcase a new (old) rustic look! 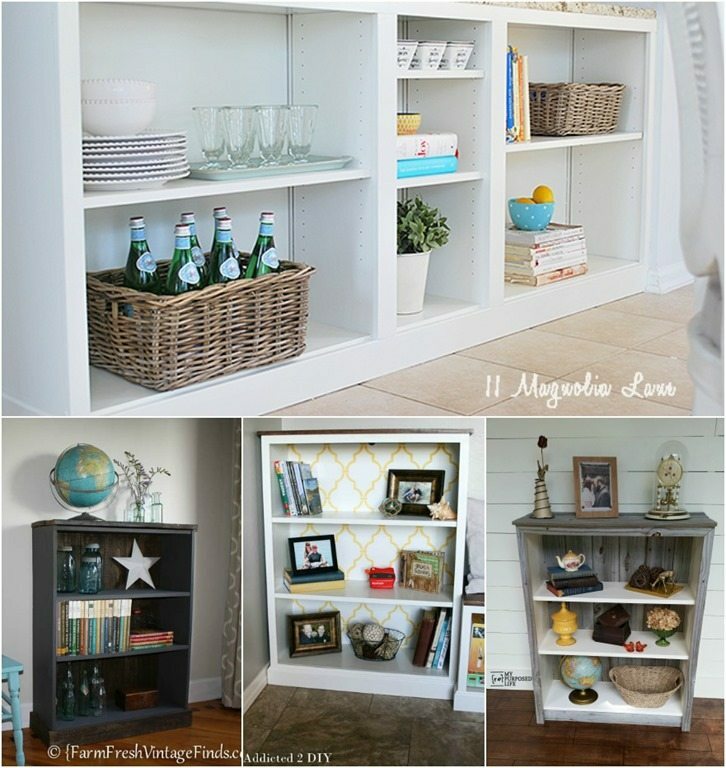 My Homeright ambassador friends are sharing their own bookcase makeovers on Homeright.com, be sure to check them out. NOW for the giveaway! I’ve been telling you about this fabulous giveaway all month long. The giveaway ends in just a few days. It’s your last chance to enter. See more details on the Finish Max, Rapid Clean and the Spray Shelter by clicking on one of those links. Mandatory: Leave a comment on this post telling me why you want the prize pack of a Finish Max, Rapid Clean Kit, and the Spray Shelter. (use the last option on the Rafflecopter widget after leaving your comment) Must be 18, US resident. Void where prohibited by law. Hop over to Homeright.com to vote for your favorite hack. Everyone who votes will be entered into a random drawing to win a Finish Max, Spray Shelter and a Rapid Clean Kit. Disclaimer: Because I am lucky enough to be a Homeright Ambassador, Homeright supplies me with products to review. All thoughts, opinions, and projects are my own. Oh how I would love this , I have projects that I haven’t done because of the inconvenience, I’ve always wanted a Homeright sprayer!! Lovr it. I’d like to use these items on my moms old trunk. I actually have a dresser I’d love to use this on! I have some projects that ive havnt done and this sprayer could come in handy around here as im building my place would be lovely to have. It looks AWESOME Gail! I so no Ikea on this project 🙂 Great job! I love the rustic look! I would also love to paint some frames with the Finish Max. I have alot of doors and several furniture pieces that need painting. Knocked it out of the park with this one, Gail! My daughter is borrowing your idea for her IKEA furniture. Also so jealous of your spray booth! Good for you! Cheers! I would love to win this package. We have a garage that would hold 2 semi tractors. But do you think I can find a corner to paint!!! NO! So this would be awesome I could use the shelter without having to wait for my husband to find me a spot. Love the bookcase, something so simple but looks wonderful. Thanks for the chance. I love to do DIY projects and have to do them outside. I don’t want to have paint being wasted by having the wind blowing my paint if I’m spraying and this would help keep the paint where I want and need it. Also it would be kept from the elements of the hot beating sun or other things that would keep the paint, stain or whatever from sticking properly to whatever material I happen to be working with. Great idea. I would love to win these items, esp the shelter, so my husband will never again complain about me accidentally “painting” our grass or driveway. I have a max finish and it’s great, but eould love the paint shelter and cleaner. I have lots of projects in mind to do! I think this sprayer would come in super handy for my porch rail and posts. I was just out there tonight…thinking MAN! they need painting! the shelter would be great for those furniture projects. Your Ikea Cabinet looks fantastic! Great job Gail. Drink lots of water and stay cool– y’all are getting pounded there with crazy weather! I love to use spray paint, so I would love to have a finish max for all my upcycling projects. The spray shelter is also a necessity as the wind always seems to come out of nowhere when I want to spray paint! LOL The rapid clean just adds to the trifecta of awesomeness! I love all your projects and wonderful tutorials! Keep up the great work and thanks for sharing! I am so impressed with your projects using these products – I really want a set for myself! Then maybe my projects can be as awesome as yours!! Oops messed up my email address on the above comment. Sorry! Gail, I’ve only been following you for a short time and in that time you have inspired me to rethink how I can reuse/repurpose the furniture I have. I am currently working on painting an old dining table and also have plans to customize a big-box-store bookcase, like your IKEA Billy bookcase. I would be so happy to use the Finish Max sprayer, Spray Shelter and Rapid Clean Kit for this project. Thank you for feeding my creativity by sharing yours!! If I won this package – I would start by painting a little stand that I picked out of someone’s trash last week. Oh, don’t tell the neighbors it was me. I wish I could do woodwork like you. You are terrific! Yes, Gail, you made it very hard to tell it was an IKEA Billy! Leaving the interior white lets the items within really pop, which is definitely the look du jour. Seeing you use chalk paint then poly in the Finish Max has me thinking it deserves the #1 spot on my wishlist, to be used on picture frames and accessories like my vintage lazy susan with “piecrust” edge and scratched beyond repair tonal painting. Imagining the benefits of the spray shelter and cleanup system put me in a reverie imagining all my mixed n matched bedroom furniture painted to match some fabulous new bedding. I Love painting and redoing things to make them look different, but when it comes to wall decor and small decor items it can become time consuming and Spray paint cans can get costly. Also, it could be a good way to use up small amounts of paint I have left over from home improvement projects without buying more paint. I Love DIY projects and when I worked at Home Depot they were always getting me to do DIY demos for my decor dept. I’d like to win this fabulous prize pack because it’s FABULOUS! I love the old gray tone of the wood. Nicely done. Nicely done – love the gray of the old wood used. Really nice–I LUV a good face-lift! You know I love that OLD look. Great job. Funny, when I was a teen I thought OLD stuff was….well, you know…OLD! But as I have gotten OL……I mean aged, I find myself drawn to so much of that stuff that was once looked upon by me as OLD! Guess I am turning into an ANTIQUE! I have never owned a sprayer but have seen all the awesome things you do with one so I really, really want to try it! Love this. I have benches I need to make/paint and this prize pack would be amazing for those and my other projects I have planned. I would probably have to use a bucket and hose to clean the sprayer. Cistern water makes me think of how to clean but conserve at the same time! The shelter would held keep debris off of my paint projects, since I do not have a designated workshop area. Using these tools sure would make the work go faster! Looking forward to one day getting the smooth finish a paint sprayer gives. First off – love the bookshelf makeover. I have one of these in my craft room and just may have to give it new life. I would like the prize pack because I have so many projects just waiting in the wings and these would make it so much easier to get them done. I could put this prize package to good use!! I have tons of projects that would get done sooner then in the next ten years!!! Hi! My family just bought a house and I have some new-to-me furniture to refurbish!! I have about 6 projects in the works, and I’d love this kit for each of them!! Thanks! Would love to have the sprayer, lots of thing to do-over, would be so much more motivated with the rights tools! Something small I would love to paint with the sprayer would be steel roses that I make. I need the Homeright spray shelter, finish max & rapid clean because my entire garage was covered in a layer of silver after my last DIY and my husband didn’t appreciate glittery tools!! I have a bunch of picture frames that could use a good spraying! I would love to have this Homeright prize pack because I love to refinish furniture and have always wanted to try using a sprayer! I could use this whole kit to make some shepherd hooks and paint them without the wind messing everything up! Luv the weathered look too! Ill have to try it! love the bookshelf! I’d use the prize for my projects! Would save so much time! I love it! Very clever. The paint shelter looks very handy. I would love to win this package for several reasons. I paint in my driveway and the shelter would be wonderful – maybe the jasmine growing alongside the driveway would not be painted so often! I have several wicker pieces that need painting and the finish max would be wonderful for that (as well as many other painting projects). The rapid clean kit just sounds life changing! I LOVE your blog – look for you on Facebook every time I get on FB. Thank you for taking the time to invest in people’s lives you don’t even know. We love what you do to repurpose. So many people think I am so creative; they don’t know that I get so many ideas from gals like you. You ask “WHY I WANT” the prize pack? I NEED this because I use this big spray painter from my husband’s business, I get paint on the side of my house, on the bushes, etc. This would be amazing! Love love love this!!! Ikea who? This shelf has a beautiful personality all its own. Just adore the weathered wood!!! I LOVE being able to transform furniture and cast-offs into beautiful and functional items through re-purposing and makeovers. As a busy mom of twins, there never seems to be enough hours in the day to work on my “projects”… so ANYTHING that’s a time-saver would be a life-saver! I absolutely love the results I’ve seen you achieve with this tool… it’s so obvious that a FinishMax is a MUST-HAVE in this business! I’d clean my Finish Max with a garden hose–less mess! My daughter has picked up a few pieces from garage sales (and one even the cast off in the trash) for her new place. They’d look so much better with a coat of paint! So, if I won, my daughter would get “new” furniture! How cute! Would love to win the spray shelter and Finish Max. My husband happy if I stopped spray painting all over the driveway! And, he might be excited enough to use the Finish Max that he will give me a hand with a couple of projects! Looks great, especially with the sides done as well as the back and top. Good luck! I would love to win this prize pack! The shelter would be a great help to keep ONLY what I’m painting from magically changing colors ( DH, I have NO idea how that happened). The paint sprayer would more than cut my painting time in half (yay! More time for more projects) and will easily clean up, first with the garden hose outside then finishing up cleanup in the kitchen sink(next project:utility sink in the laundry). Thanks for all the great ideas! YourFinish Max, Rapid Clean Kit, and the Spray Shelter. from Home right are awesome! I would love to win them, and make great projects like you have, with the Billy shelf! I love what you did using the dense boards, its a great rustic look. I think toning down the white for the shelves with a little gray to weather them to match the boards would have been more to my taste, but the interior does “pop” with the white. Love the blog and facebook page! Wow what a transformation. Totally love it. great idea using Gorrilla Glue on the pegs. And how to repaint the shelves. Love your projects, and you have inspired me to get busy with updating/refurbishing some of my ‘treasures’ that I find while volunteering at my local thrift shop to help supplement my teacher retirement income. Since things are so tight, it would be beyond wonderful to win the set you are giving away to help me get up and running! Thanks for all the wonderful ideas (and for sharing your passion and energy). Thanks for your thoughtful comment on my Billy bookcase. I’m happy to inspire and share with my “friends”.